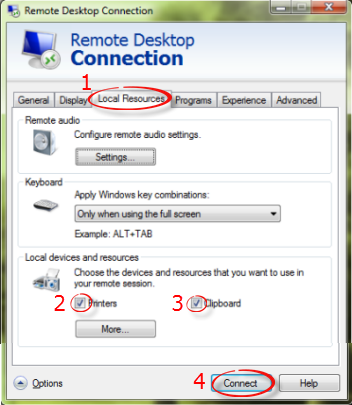 Once you connect to VPN on a college owned computer, you can access your network drives and connect to a remote desktop (ecTeams-ts) from home. You must be off campus to complete these steps, and you must have installed VPN by visiting ITS. For more information on using VPN, see the page entitled Virtual Private Network. Note: You must fill out the VPN Remote Access Form prior to installing VPN. ITS will then configure your account for VPN connection. 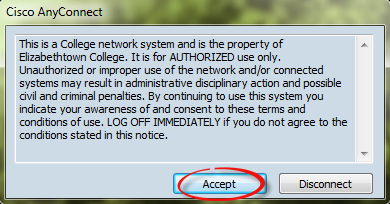 Next, please contact the ITS Help Desk at helpdesk@etown.edu to arrange a time to have the VPN software installed. 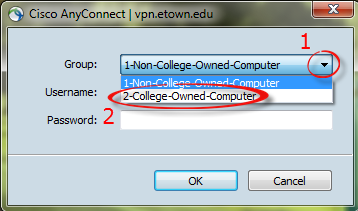 Step 2:Under Ready to connect, enter "vpn.etown.edu" and click Connect. Step 4:In the Group box, click the dropdown list arrow. Choose 2-College-Owned-Computer. 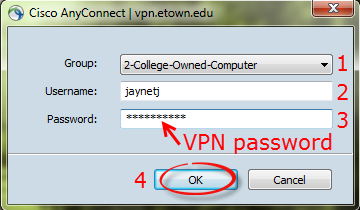 Step 5:Enter your Etown username and the password you provided on the VPN form. Click OK. Note: Make sure your username is all lowercase, otherwise you will not be able to connect. You will be locked out after 10 unsuccessful tries to log in. Contact the Help Desk to have your VPN account unlocked. Step 7:You are now connected to VPN. Please visit the Help Desk to obtain the map network drives program on your college-owned computer if it is not already installed. Use this program when you are connected to VPN to map your network drives. 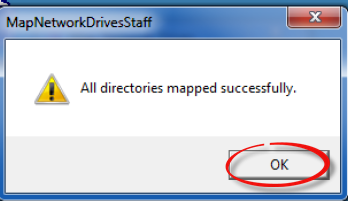 Double click on the map network drives program on your desktop. 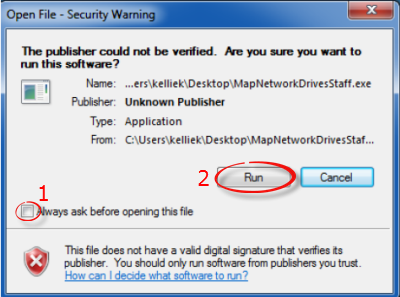 Step 3:On the security popup, uncheck Always ask before opening this file. Click Run. 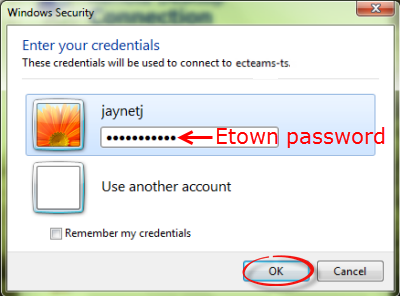 Step 4:Enter your Etown network username and password and click OK. Step 5:Click OK after the network drives are mapped successfully. Step 6:Double click on the Computer icon on your desktop. Step 7:You will see all network drives listed. You have full access to files stored on the network. 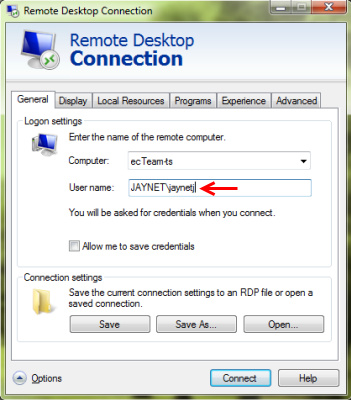 If you don't have Jenzabar or InfoMaker installed on your college-owned computer, you can use Remote Desktop Connection to connect to the ecTeams-ts server. You can work with Jenzabar and InfoMaker on this server. 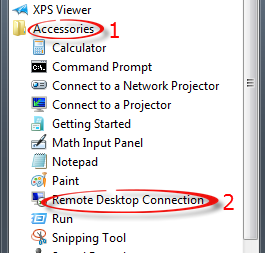 Step 2:Select Accessories and click Remote Desktop Connection. 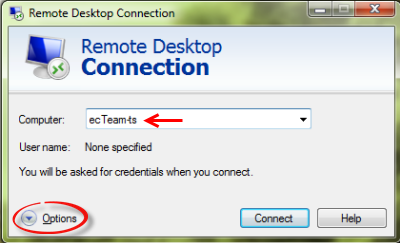 Step 3:In the Computer box, type "ecTeams-ts". Click the Options arrow. Select the Local Resources tab. Check Printers and Clipboard. This will allow you to use your home printer and copy data from the ecTeams-ts server to your computer. Click Connect. 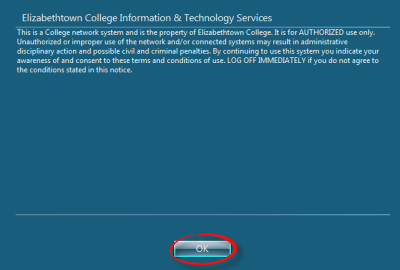 Step 6:Log in to the server with your Etown network username and password. Click OK. Step 8:Once you see the desktop and computer ID bar at the top, you are ready to work with Jenzabar or InfoMaker.